I’ve done a lot of Star Wars work that’s aimed at younger kids, roughly ages 4 – 12. My personal creator-owned projects, however, tend to be a little more mature/PG-rated. Henry: Grant’s done a lovely Yoda illustration that is on display in my son’s room. His collage of Lord off the Rings villains graces my study. Tell us about your latest effort. 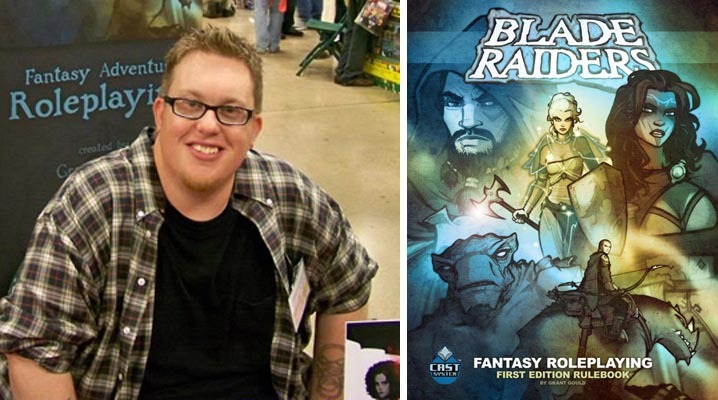 I’m currently writing and illustrating books for ‘Blade Raiders’ (BladeRaiders.com), which started as a role-playing game, but is now also branching out into novels and comics. I also have some upcoming Star Wars work that I can’t announce yet, but I’m very excited about. Henry: Upcoming Star Wars work that you can’t announce yet!? You are a big tease, sir! What do you hope the audience will get from ‘Blade Raiders’? I’m hoping fans of ‘Blade Raiders’ will experience the same kinds of thrills and sense of adventure that I felt as a kid when I played things like Dungeons & Dragons with my friends. Those games and stories can really open up the world of creativity and imagination. What aspect of writing/illustrating do you find most challenging? Focusing on one thing at a time, because I always have several projects going on at once, and juggling them can be tough. Henry: Tell me about it! I wonder if most artists and writers are ADD (not to be confused with AD&D). What is a powerful lesson you’ve learned from being an illustrator? You’re never going to create something that everyone loves. You have to be able to handle criticism. Henry: It’s a delicate balance. You should feel satisfaction with the quality of your work, and yet always set the bar higher and higher to hone your craft. You have to be a sensitive artist, and yet have a thick skin. What has been a memorable experience that you never would have had if you had not been an illustrator? Going to conventions over the years has given me some great opportunities, including becoming friends with many other artists. Henry: Yes. My sons and I got to meet you at a San Diego Comic-Con. A.B.C. – Always Be Creating. When I was a kid, I discovered the Henry James quote, “Try to be one of those on whom nothing is lost.” I always loved that. Don’t waste your time on this Earth, and learn to appreciate and see the lesson in everything. Not really. I usually listen to movie scores or podcasts while I work. Tough to choose, because I love fantasy creatures! I might have to go with werewolf, because I’ve always loved wolves and werewolves. Dragons would be a close second. Henry: I don’t mean to hound you with my puns, but I’m Lycan your choice. I’m addicted to the videogame Skyrim. I play that on my Xbox 360 all the time. Otherwise, I do the usual things: hanging out with family, watching movies, reading comics and books, etc. Henry: The Force is strong in this one. Categories: Books, Fantasy, Fantasy, Gaming, Science Fiction | Tags: Blade Raiders, Dungeons & Dragons, fantasy, illustrator, interview, scifi, Star Wars | Permalink.